please permit me to start this post with that, lol. Not necessarily heels, infact, I am a mid-heels, block heels, brogues & oxfords kinda girl. They must be comfortable though. Comfort is usually my first criteria. I do have pairs that aren't comfortable and I have promised myself that if there is a way I can swop them, I will. The dress code is - DRESS WELL because there will be a lot of paparazzi snapshots going and heaven forbid that you are caught on the pages of BellaNaija of Linda Ikeji with a foot gone wrong. Besides loads of Fashion lovers, socialites and celebrities guests are expected to attend. It’s a day of fun, shopping and networking with loads of Christian Audigier Champagne & hors d'oeuvres. Also, guests are entitled to 5% off all shoes, spend N50, 000 and get a free professional pedicure, spend N120, 000 and get a free manicure & pedicure. Date: Saturday, 12th July 2014. 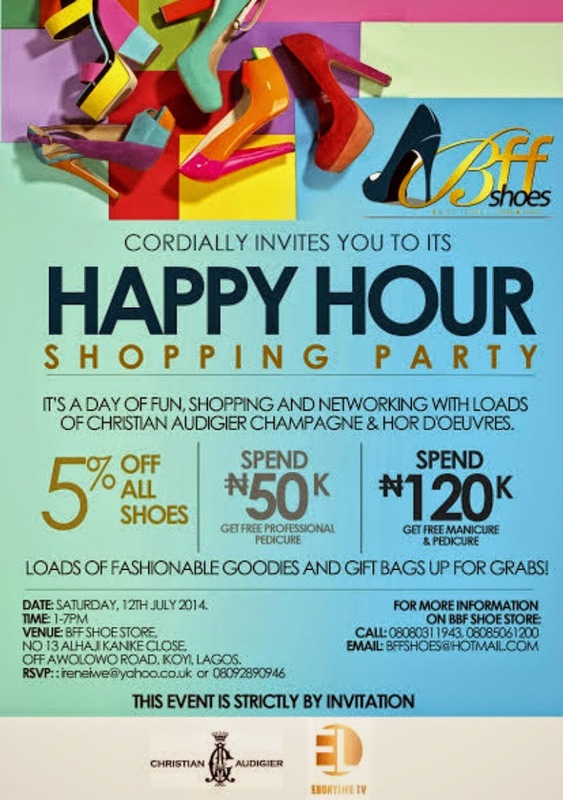 Venue: BFF Shoe Store, No 13 Alhaji Kanike Close, Off Awolowo Road, Ikoyi, Lagos. Sounds like fun. unfortunately I'm down with a cold. Going nowhere till I feel better. I trust you to show us everything on Instagram.